Their dense root systems keep sediment from rivers and off the land from going out to sea. This helps stabilize the coastline and provides some protection from hurricanes and tropical storms. 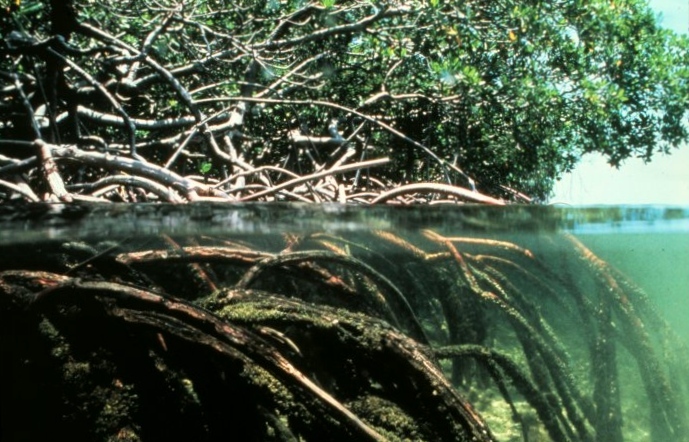 [Studies have shown storm damage is usually greater in coastal areas where mangroves have been cleared.] It also prevents nearby reefs and seagrass from being smothered by sediment runoff. They serve as nursery and/or home to a wide variety of fish, shrimp, crabs and mollusks. A study of Mesoamerican Reef off the coast of Central America, for example, found that fish populations in reefs were as much as 25 times larger near mangroves. 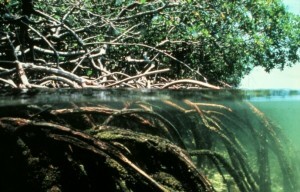 Mangroves also can provide medicinal plants, rot-resistant wood for building, and animal fodder. And in some areas of Latin America and the Caribbean, they are becoming attractive snorkeling destinations to view all the underwater species that live in them. In my “Basics” piece long ago I stressed the importance of having good diagnosis as a foundation for good policy and enforcement. Mexico, like so many countries in the Americas, has had a spotty and inconsistent record on protecting these important wetlands. Part of the problem, they say, has been uncertainty and disagreement over just how much mangrove forest they have to protect, where they are, and what shape (ecologically speaking) they are in. 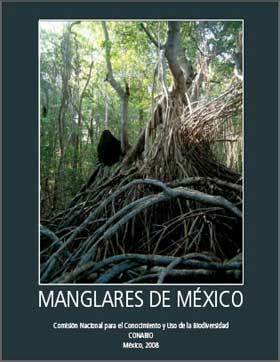 To correct this, several government agencies — primarily the national statistics institute (INEGI), the national forestry commission (Conafor) and the national biodiversity commission (Conabio) — put together and published earlier this year a national inventory of mangroves. The resulting database will be the foundation of a monitoring program. The inventory also identified 55 areas that will be targeted for special protection and rehabilitation. Dijo qe al contar con la mejor información científica posible, el Gobierno Federal tiene la oportunidad de establecer políticas públicas para proteger y conservar los manglares de México, lo cual es una tarea prioritaria de la presente administración, ya que estos ecosistemas constituyen una parte importante de la riqueza natural del país a lo largo de la línea de costa de ambos litorales y es considerado uno de los ecosistemas más ricos del planeta. Indicó que la elaboración del Inventario Nacional de Manglares termina con este problema de metodología de evaluación y proporciona elementos sólidos para saber que actualmente existen en nuestro país 655 mil hectáreas de manglar, y ahora sí se podrán conocer, con total certeza científica, las variaciones registradas en este ecosistema, ya que así como pudo haber disminuido, también pudo haber aumentado.